That burst of questions asked by students President University (PresUniv) in the event Employer Goes to Campus with Hay Group on the topic A to Z About Salary Negotiation organized by the Internship and Career Center, Monday (23/5) morning. Speakers from Hay Group is Ika Saraswati, Head of Productized Services/Team Leader. The event that was held at the auditorium of Charles Himawan, PresUniv Campus, Kota Jababeka, Cikarang Baru, Bekasi, was attended by dozens of students, including some from the Evening Class Program. All the questions are answered swiftly by Ika Saraswati. "Passion is important, but not to actually limit ourselves," she said. Or, "To get a better bargaining position, performance—including physical performance, it’s important. So during the interview, it is important for you look to be polite, neat and clean. " 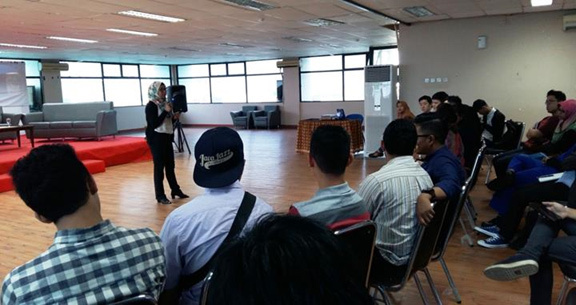 Ika Saraswati (standing) during a dialogue with students in the event Employer Goes to Campus with Hay Group, Monday (23/5). That some questions from the students during the event. Hopefully it helps students to prepare themselves to enter the workplace.